After the tally was all said and done, there were five players, two skaters and three goalies, who all finished with 8 points in the week, which brought us back to the tie-breaking processes. The two skaters involved, Mikko Koivu of the Minnesota Wild and T.J. Oshie of the Washington Capitals made it through the initial tie-breakers, since they scored goals and it was down to them in the end. But as you can tell by the header graphic above, Oshie was our eventual winner, as he finished with 5 goals and 3 assists in four games this week, taking the title. Unlike many of our skaters who end up with the award, Oshie didn't finish with any impressive point streak, rather he was shutout in game two of the week. Rather, his week started off with a bang, 2 goals and an assist on Monday in Pittsburgh, shutout against Ottawa on Wednesday, 2 goals and 2 assists versus Tampa on Friday and then he added a goal against the Rangers on Sunday. Still, a very impressive effort this week. This has lifted Oshie's totals up to 13 goals and 22 points in 32 games for the Capitals, good enough for 98th in pool scoring overall. Allan is just starting to see some bargain picking in Oshie after this new hot streak, as he took the scoring forward in the 5th round, 112th overall. If this hot streak continues, it could really make this pick look great. A busy week meant that there was plenty of points to be had and there were. Something we'll explore a little bit more in the stats paragraph, closer to the bottom. Still, five teams hit the 30-point plateau, while another handful came close. Kristy & Don were the week's best, however, picking up a pool-high of 37 points, 4 points better than Troy and 6 points better than Allan and Cindy. The move was very beneficial for the reigning champs, as their team bumped up the standings, from 20th to 17th and they were just a few points short of moving up a few more spots. Still, the most important numbers to consider is that they are still 40 points out of the money, but were making some headway with this big week. It was a huge week from the duo's goaltending, as Roberto Luongo of the Panthers and Semyon Varlamov of the Avalanche were two of the five players that finished the week with 8 points, as their two goalies were better or the same as three teams in the pool this week, all finishing with or less than 16 points. There were also some key contributions from Philadelphia's Sean Couturier and New York's Keith Yandle, each finishing with 4 points in the week, while three more players each had a trio of points as well. On the less than bright side, they did have three naughts on their team, but those were not felt nearly as badly as some other teams may have found them. We are now two weeks into the second segment of the season, something that would normally have a prize in most years, but there isn't this year... nevertheless, Kristy & Don are tied with Scott for 2nd in the segment to this point, still trailing Stuart by 7 points. Still, these segment breaks are good indicators about how well the Waiver Draft did for your team or how it's done after the draft, at the very least. If you're studying the effects of injuries on a hockey pool team through the season, look no further for a case study, than John S.'s team, which is writhing with injuries at this very moment. As of Monday morning on the news page, he has five players on the list who are on the Injured Reserve and another couple, who are day-to-day. How his team still managed to pick up 13 points is still quite amazing. Sure, it helps to have Ryan Spooner of the Bruins, who had 6 points, and Patrick Kane of the Blackhawks, who had 4 points, but that's 10 out of 13 points right there. His team is chalk full of potential, but the injury bug has run rampant over it. The poor week in Week Eleven has now pushed John's team down from 7th to 12th in one week and his team has really fallen off the money pace, with very few signs of recovery now. His team is now 30 points back of 3rd place and he desperately needs bodies to become healthy again or it's lights out for him. It's a damn shame we're only a couple weeks out of the last Waiver Draft, he could have used some of those injury moves to help his team goon it up down the stretch. He's only 102 PIM back and has some real potential to drop players. Oh well. We have ourselves a new arrival in the money spots this week, as Troy's team has realized some huge potential and climbed into 3rd place in Week Eleven. His near Mover & Shaker week really helped his team jump right up and mingle with the money teams, now it will be a matter of both staying there and usurping some positions. John P. continues to lead the pool, his 4th consecutive Monday morning with the lead, while Jeremy, who touched 1st place during the week, now sits in 2nd place, improving upon last Monday's start of 3rd place. The gap from 1st to 3rd is only 6 points, while Neil continues to be within pouncing distance, 3 points back of 3rd in 4th, while Brenda & Seward are only a couple points back of Neil in 5th. Dale B. fell out of the money spots, as he held 2nd place last week, but he dropped down to 6th, now 7 points out of the money, but still within range. Stuart has some work to do to get into the main money group, but his team was working quite well last week and gaining some momentum. His team is now 7 points behind 6th place, which isn't very far at all. Rookie scoring was fairly weak, but Ryan still extended his lead by a couple points, thanks to Blackhawks forward Artemi Panarin and his 2 points. That was the only rookie on his team to score, while Troy's pair of freshmen failed to register a point in the week. Ryan's lead now has been extended to 28 points, unlikely to shrink by very much, anytime soon. The pool successfully took another team, leaving only four surviving teams left and we are coming up to the Christmas Break, which will add a wrinkle to the story of the season. Dale B., who was down to only one healthy goalie on his roster, was eliminated from the survivor pool in Week Eleven, because Jaroslav Halak couldn't manage to find a win for the Islanders this week, as Mike Smith of the Coyotes was on the shelf. This leaves John P., Jeremy, Stuart and Allan in contention for the title and their money back, but with only 36 NHL games on the schedule, there will be very limited chances at getting the job done this week. There will only be four nights worth of action this week and some NHL teams will only get one game in these seven days. John P.'s goalies will get three games, Jeremy's will see four games, Stuart sees two games and Allan will be around for five games. Stuart is the only one of the four that has one goalie active and I would imagine some of those possible starts will gets shuffled off to the team's other goalie, but it will be interesting to find out. Check back later today for Monday's possible starters. It was the busiest week of the year so far, but the pool, with a couple teams with newly-acquired goons, couldn't set any records for time in the box, which is a little perplexing and a bit disappointing as well. Wes still holds the lead in the pool, but his lead has shrunk and it's starting to get interesting that way. Brian and Dale B. are now only 34 minutes behind Wes for the overall lead and neither of these teams gooned it up at the Waiver Draft. 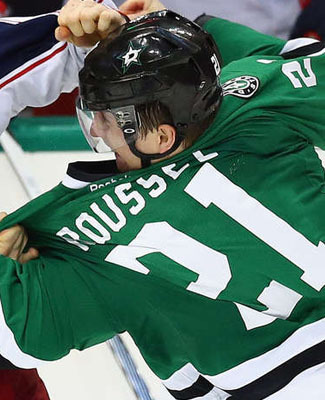 Okay, well, maybe Dale did, with the selection of Antoine Roussel, who has been doing a good job keeping him in both races, with 16 PIM in six games since being taken. Dale C.'s team was the goon team of choice this week, because he scored a huge goon game from Wayne Simmonds of the Flyers, who had 17 PIM by himself earlier in the week and it just built up from there. It was a 49 PIM week for his side and his team is now 41 minutes back of Wes. Derek & Dan, the other side to goon it up at the Waiver Draft, had a better week than Wes, but only marginally. They still sit 47 minutes back of the leader and are still waiting for something big to happen with their two goons. At the very least, I am not too disappointed with how this race is turning out, a couple weeks in past the Waiver Draft, especially with a few teams legitimately trying to draft around the PIM pool are still sticking in the program. So, yes, it was a very busy week in the league, right before the Christmas Break week, which is quite the opposite. This week will be the busiest week of the season, up until it is surpassed by Week Twenty-Four, so this is one that will set some benchmarks, for sure. The pool scraped together 656 points in total, a season-high, but only scored at a rate of 12.86 points per NHL game, which is only 6th best this year out of 11 weeks. Skater games played, minutes played by goalies and PIM per NHL game were all down from the week before, which is somewhat disappointing. This pool needs some healthy bodies back to get back on track. Chicago forward Marian Hossa was a late scratch on Sunday night, just before their game against San Jose, as he is dealing with an apparent upper-body injury. The word from the Blackhawks coaching staff is that they think that the injury isn't serious and that they hope to have him back after the Christmas Break, which suggests that he'll miss Tuesday's game in Dallas, but potentially be back for Sunday's game, home to Carolina. Derek & Dan are hoping to win the the PIM pool without tanking in the overall pool, like some teams, so they really didn't need this injury right now. Hossa has definitely been keeping them afloat in the main pool, so they will keep their fingers crossed that Santa brings him a clean bill of health for the New Year. The New Jersey Devils opted to sit veteran forward Patrik Elias for Sunday's game in Boston, which was the second half of back-to-back nights for the Devils. Elias did get off to a pretty good start after his season debut from injury, but since then, hasn't exactly been that productive. The Devils remain in the Eastern Conference playoff hunt, so they will need to find a way to make Elias more useful to them before too long. Troy snaked Elias late in the Waiver Draft, taking a flyer on him, but that has yielded very little in the first two weeks of availability. Only 1 point in his first six games is all he has to show for it, but he could very well come around before too long. One of the biggest bargain picks in the draft this year, San Jose's Joel Ward, was a scratch on Sunday night, due to an upper-body injury. It is suggested that Ward was hurt during Friday's game against the Senators and that he just needed a night off to get things back on track. If that's the case, he should be okay to go against the Kings on Tuesday night, their last game before the break. 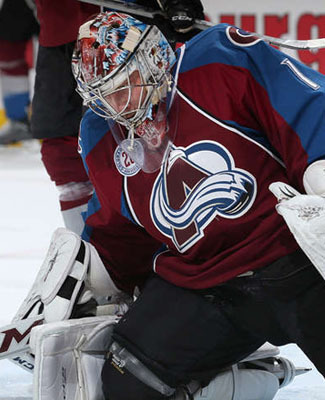 If not, consider him day-to-day, more likely to return next Monday, home to the Avalanche. Well, if he misses this week, it's only one skater game missed for Dale B., who arguably could use it right about now, given his situation with the money teams right now. Ward is the 2nd best pick in the draft this year, taken 338th overall and ranks 86th, a huge gain and a big reason why Dale is close to the money. A concerning moment for the Vancouver Canucks, as Ryan Miller left one shooter into the shootout against the Florida Panthers on Sunday evening, leaving the game to Jacob Markstrom to finish off. The team later confirmed that Miller was only dealing with some cramping issues and that nothing was deemed serious, it was just that he couldn't continue in the skills competition. If the Canucks were to have won that game, which they didn't, Markstrom would have been credited with the win. Either way, it was a loss and Clayton didn't end up with 2 points from that game, regardless. Clayton's goalies have been a terrible disappointment this year and a big reason why his team has fallen below the halfway point in the standings, as no one has been able to make up those points. He should expect Miller to be back though, which is good news.